Tap on a phone number to place a call. Tap on an e-mail address to compose and send an e-mail. Tap on a Web address to open a Web page. Tap on a street address to see it in Maps. A quick and fun way to delete e-mail messages (in the list view of a folder) is to simply swipe your finger across it (in either direction). A red Delete button will appear to the right of the message to confirm the deletion. If you change your mind, you can tap anywhere outside the button to cancel the action. This finger swiping action lets you delete items in a number of the built-in applications. You can further reduce the drain on the battery and reduce e-mail overload by limiting the amount of e-mail you download to your iPhone. Immediately below the Auto-Check setting on the Home >Settings >Mail screen is the Show setting. You can set this to display a specific number of the most recent messages: as low as 25 and as many as 200. If you want to see additional messages, tap on the Download More button in the Mail program. Select Mail at the bottom of the screen. Auto-Check is below the Accounts section. NOTE: The more frequently the iPhone auto-checks for e-mail, the more battery power you use. Set the time higher or set it to Manual to conserve battery power. Double-tapping the Home button on the iPhone (from within any application) will open the Phone application. On the iPod touch, it will open a pop-up control for music playback. When the iPhone and iPod touch are locked, double-tapping the Home button will bring up the music playback control; double-tapping it a second time will close the control. After you confirm the erase with two taps, your device will delete everything (which takes a few moments) and then reset itself. If you work at a secure facility that prohibits the use of cameras, you can get the camera removed from your iPhone. A service called iResQ (iresq.com) will send you a preaddressed shipping box and will return your iPhone with the camera removed for about $100. This will void your warranty. You have the option of locking your SIM card so that it can’t be used by other phones. To do this, go to Settings >Phone >SIM PIN, tap the On button, enter a passcode, and tap Done. Note that if you set a passcode, you must enter it every time you power on your iPhone. If you want to find the nearest Wi-Fi hotspot in your area, visit jiwire.com and type your address or city to locate the closest one. You can also use your Maps application and do a search like “wifi chicago” or “wifi 90004.” Red pushpins should then show you were to go. If your iPhone locks up or stops working for any reason other than a low battery, you’ll need to reboot it. This is analogous to turning your desktop or laptop computer off and on again, and it clears up a lot of problems. Press and hold down the Sleep/Wake button on the top edge of the device and the Home button until the Apple logo appears on the screen. Then release both buttons and wait until the Home screen appears. Read more about Locked up? Reboot! You can use the Home button to completely shut down whatever program is running—just hold it down for six seconds. This is useful if a program freezes or if you have multiple programs open at once and want to close one of them. The iPhone is covered by a one-year limited warranty that covers it against defect, but not misuse. So, for example, if you bounce it off the wall or throw it on the ground, you’re responsible for the damages. In addition, if you hack the device, open up the case, or make unauthorized repairs, you void the warranty. You can extend the iPhone limited warranty for an additional year for $69 ($59 for the iPod touch). Repair for an iPhone not covered by a warranty will cost you $200-$250 plus shipping ($150-$250 plus shipping for the iPod touch). Apple added a scientific calculator to the iPhone 2.0 software. Tap on the Calculator icon to open the standard calculator. 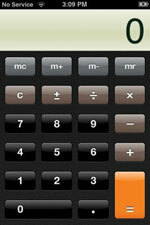 Rotate the iPhone or iPod touch to horizontal and the scientific calculator is displayed. Battery replacement kits with instructions and tools are available for both the iPhone and the iPod touch. This approach is usually less expensive than sending the device in to Apple or AT&T, but if you do it yourself, you’ll void your warranty. A Google search will help you find instructions. Eventually, as the battery gets older, you’ll begin to notice that your iPhone or iPod touch has to be recharged more frequently. When you’re no longer comfortable with this, it’s time to replace your battery.